Here's my review of Platypus' Cleanstream Gravity Filter: as soon as I see the word "backflush" appear in the instruction manual, I'm out. Okay, maybe that's not entirely fair. But memories of MSR's Hyperflow Microfilter, with its mandatory but inscrutable backflushing requirement, still haunt me. 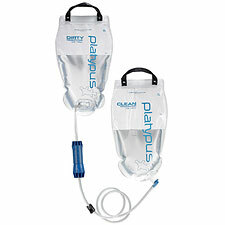 Yes, the Platypus Cleanstream does require (or at least strongly advise) backflushing before each and every use. But backflushing the Platypus, mercifully, isn't nearly as complicated an ordeal. In terms of operation, the Cleanstream sounds quite simple. Put dirty water into one reservoir, hang it up somewhere, and let gravity pull the water through a microfilter, filling up a second reservoir with clean, purified water. In practice, you are going to have to worry about finding a place to hang both reservoirs (at different heights), you are going to want to backflush the microfilter, be sure you don't drop the microfilter or allow it to freeze, and manage the various reservoirs/hoses to be sure you don't inadvertently cross-contaminate the system. So, the Cleanstream's promise of effort-free filtration is kind of theoretical, especially if you're just interested in filling up your water bottle in the middle of a hike. Output speed, at a specified 1.75 liters of filtered water per minute, is comparable to most other filtration methods but feels faster given that you don't have to do anything while the Cleanstream is working. As for the dreaded backflush, with the Platypus you need only lift the clean water reservoir (when filled) higher than the dirty reservoir—a manageable task, even for me. The Cleanstream weighs a solid but reasonable 13.7 ounces (compared, for example, to the Katadyn Hiker's 11 ounces). Curiously, you must bring the Clean reservoir with you, even if you're already carrying a Platypus hydration bladder. The two aren't interchangeable. Note that as with all filter-style systems, actual weight always goes up in the field because you'll end up carrying small amounts of trapped water in the bladders, hoses, and filter cartridge. I like the speed and relative simplicity with which you can filter large quantities of water (note: like most microfilter systems, the Cleanstream does not kill viruses). But I must say I can't easily envision a situation in which I'd actually want to carry one of these. Gravity-fed filters like the Platypus are probably best in base camp, car camp, or large group camping situations. For everything else, I've forgone microfilters entirely for the UV-based SteriPen systems, which are really just the simplest solution in the field.